A purple potato that growers claim is healthier than the standard variety is going on sale in UK supermarkets. The Purple Majesty has a distinctive deep colour and contains up to 10 times the level of antioxidant, anthocyanins, compared with white potatoes. It was developed at Colorado State University from a traditional variety. Despite its appearance, the potato now being grown by Perthshire producer Albert Bartlett after two years of trials, is not genetically modified. Potatoes originate from the high reaches of the Andes and come in thousands of varieties, with many having developed deep red and purple colouring. The trials found that the Purple Majesty could be grown in Scotland. An initial crop of 400 tonnes of the variety will go on sale in Sainsbury's stores across Scotland and the south-east of England this week, with a larger yield expected next year. Albert Bartlett, which has its headquarter in Airdrie, has been working with Queen Margaret University in Edinburgh and the Scottish Crop Research Institute to determine what health benefits there could be from eating the potato. 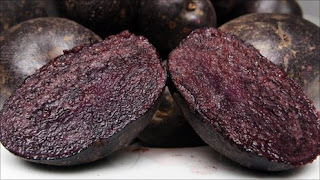 Dr Catherine Tsang, who took part in research, said: "Our research specifically looked at Purple Majesty potatoes which, unlike white potatoes, contain a natural pigment called anthocyanins. "It's this pigment that gives the potato the purple appearance, but more importantly, it possesses antioxidant properties, which are maintained even after cooking." She added: "We're all aware of the stories about red wine having a more positive effect on the heart than white wine, due to their higher levels of antioxidant. Dr Tsang said anthocyanins contained antioxidant properties which some studies had suggested could have a positive effect on blood vessels and reducing blood pressure." However, other studies have found little evidence of the conclusion.